A few years back, my wife was given the news after her yearly scheduled mammogram, that there was a lump found in her breast. Her doctor explained that it had to be removed BUT with the diagnosis…he wouldn’t know for sure if a mastectomy or lumpectomy would be performed until the actual surgery. It is hard to wait! The ‘not knowing’ can definitely play tricks on ones’ mind. You can pretend to be “spiritual” in times like these, but PRETENSE doesn’t last for long. My wife and I began listing numerous Scriptures on pieces of paper, then placed in our bibles and even on the refrigerator–constantly reminding us of God’s promises of healing. However, the difficulties of waiting for the results; the process of upcoming Radiation Treatments after surgery tends to erode the concept of being “spiritual” through it all. The most famous man on earth; extremely wealthy; the best of the best. But Job lost it all. Not only did he lose everything, surrounded by carnal, judgemental friends…even his wife urged him to curse God and die! Job found himself in the waiting room. Some of you reading this POST can identify with Job. I certainly did as I read, studied and mediated everyday. You’re waiting to hear from God…you can’t see what’s going on in your difficulties whether it is personal or someone who is close to you. But you find yourself in the WAITING ROOM. Not understanding all that is going on is frustrating. 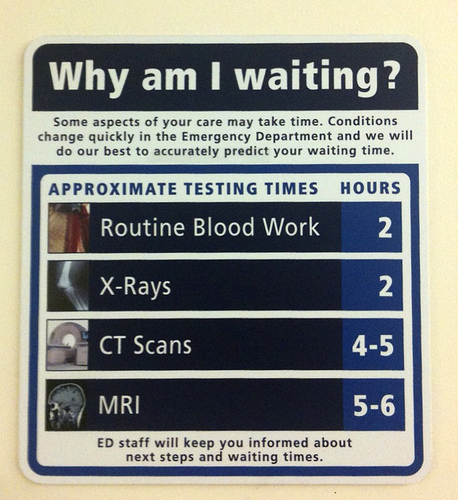 I remember sitting in an enormous hospital waiting room the day of my wife’s surgery, looking at an electronic display on the wall with her name listed and the time of the surgery, updates were posted regularly, but the results were absent. I trusted God’s hand guiding the surgeon’s hands, but it was still frustrating. I’ve always wondered about that old cliché, “The Patience of Job.” For the more I read and study the book of Job, the more I see how impatient he really was. — He couldn’t understand what was going on. — He didn’t like how his life was going. Aren’t our lives at times so very similar to Job’s? One day we are secure in a profession–friends and family surround us–a “roof over our heads”–“good health”–and then all of a sudden… everything is snatched like a rug under our feet. And yet Job still had the sense to WORSHIP God in the midst of the pain and agony. Don’t desert the WAITING ROOM. That is where you are the most likely to hear from God. [Illus. Elijah at Cherith]. PRAY… In the midst of our long-suffering, we are misguided in our thinking by the enemy…“God isn’t going to act here”, and we stop PRAYING for answers (Job 42:1-5 a). God doesn’t do His deepest work in the shallowest parts of our lives. Get alone with God in a time of reflection, evaluation, correction, and dedication. Remove yourself from all the distractions. All the while my wife was going through surgery two floors above the waiting room, I forced myself to walk outside for a few minutes to refocus on Dianne and not on myself by having a conversation with Abba Father. Afterwards, I returned to the waiting room refreshed and with a new direction of anticipation. WHERE ARE THE RESULTS OF THE TESTS? WHEN CAN I SEE MY WIFE IN RECOVERY? WHY IS THIS HAPPENING TO OUR FAMILY? Psalm 46:10, “Be still and know that I am God.” Literally, “Let your hands hang down.” We want to always do something;while God may need to do something in you before He does something special for you or through you. When waiting and praying, do you EXPECT…FORESEE…even EXPECT a response from God? God never left Job alone in the waiting room, nor will He ever leave you alone in the “waiting”. “And it was so that after the Lord had spoken these words to Job…” (Job 42:7) [NOTE: Romans 5:3-5; 8:18]. God gave Job a new perspective, one he would never have had if he had abandoned the waiting room. JOY… “In every prayer of mine I always make my entreaty and petition for you all with JOY (delight)” (Phil. 1:4). PURPOSE… “I press on toward the goal to win the [supreme and heavenly] prize to which God in Christ Jesus is calling us upward” (Phil. 3:14 AMP). PEACE… “Practice what you have learned and received and heard and seen in me…and the God of peace (of untroubled, undisturbed well-being) will be with you” (Phil. 4:9). POWER… “I have strength for all things in Christ Who empowers me [I am ready for anything and equal to anything through Him Who infuses inner strength into me; I am self-sufficient in Christ’s sufficiency]” (Phil. 4:13 AMP). That particular verse in Philippians (Phil. 4:13), [ I wrote it down on the top of my special list of Bible verses claimed], gave me special encouragement while my wife went through her surgery and through the six weeks of radiation. She told me afterwards, this same verse gave her peace and expectancy as she was prepared for the operation. Dianne and I were “empowered” by Christ towards the outcome, while at the same time, I waited with expectancy. God was about to do a mighty work! And PLENTY… “And my God will liberally supply (fill to the full) your every need according to His riches in glory in Christ Jesus” (Phil. 4:19). 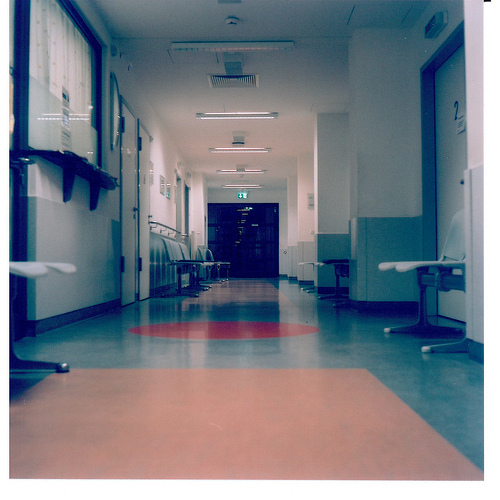 As a WAITING HUSBAND on that one day, I spent many hours in the waiting room of the hospital; not knowing all that was going on during Dianne’s surgery; not understanding it all, not being able to control the situation as I normally try to do in everyday life while pacing the floor… until it seemed I had worn the color off the tiled floors…trying to conceal my worry and anxiety from our adult children. I trusted in the doctor’s hands, stayed close to the nurses station for expected good news, prayed, and waited… anticipating the results, knowing God had this. When the doctor met with us all in a side room while my wife was in recovery, the good news came as expected. The cancer had been totally removed–and a lumpectomy had been performed in lieu of a mastectomy. The surgery had gone even better than what was expected by the physicians. But the JOY I had received eclipsed all the difficulties of the WAITING! TRUST HIM, STAY CLOSE, BE STILL… and with ANTICIPATION, with EXPECTANCY…and get ready for some wonderful DISCOVERIES! Researched Source: Commentary– http://www.jackiekay.org. *An outline published November 1997 “In God’s Waiting Room”. Scripture: Amplified Bible; NIV Bible. 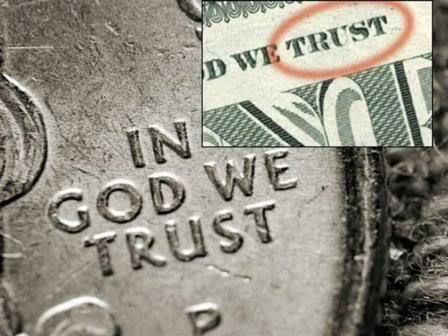 If you were to take out a United States coin or bill out of your pocket, you would find somewhere on the currency the phrase, “IN GOD WE TRUST”. This motto was adopted by Congress during our civil war, being confirmed by acts of Congress and by various courts. But in recent years there have been various groups who have challenged this motto, being a violation of separation of church and state. To date such efforts have failed–so far. There have been some interesting suggestions offered up and I will share two of them with you. The first example that I found was, “Peace be the Journey.” The writer gives this reason for adopting such a phrase: “What this country needs is PEACE, and “In God We Trust” supports religion–something that proliferates war and hostility both domestically and internationally–is far from the want of peace.” What she lacks in understanding is what Christianity really declares–namely PEACE. Our current motto never represented ALL the citizens of the United States of America. And I agree. To say that every U.S. citizen trusted exclusively in God–or that the U.S. government has trusted God exclusively is absurd! God is not nearly concerned about whether we say trust in God nearly as much as whether we actually trust in God. The Israelites claim they trusted in God–to a certain degree, they did. But at the same time, they also trusted in Baal, Molech, Ashtera, and other gods. –They trusted God but… they also trusted in Assyria, Babylon, Egypt, other nations for protection. –They trusted God but… they also trusted in their own schemes to get ahead financially which forced the poor into deeper poverty, even slavery. While the names and context is different, you can clearly see the similarities to Judah in the 8th Century BC. 1. The contrast between inhabiting the celestial city or lofty ruins. 2. Walking the heavenly path or the aimless way. 3. Working with divine ability or human inability. 4. Rising to eternal life or to judgement. B. THE FIRST CONTRAST–“CELESTIAL CITY” or “LOFTY RUINS”? ISAIAH tells us, those who TRUST IN GOD live in a strong city and we have the same call today! The writer of Hebrews calls us to look for a city “whose Architect and Builder is God” (Hebrews 11:10). And the apostle John describes the city, Revelation 21. The picture I have displayed is one of the 9 Gates into the Old City of Jerusalem today; The Damascus Gate. First the prophet tells us that the city is strong and that salvation is its walls and the bulwarks, ramparts, are the defense. Our salvation is our protection, but it is also our separation. There is a distinction between those who are SAVED and inside the city with God; protected by God and those who are NOT SAVED, outside of the city. “The thief comes only in order to steal and kill and destroy. I came that they may have and enjoy life, and have it in abundance (to the full, till it overflows)” (John 10:9-10 AMP). 1. We can’t enter by climbing over the walls; trying to SAVE OURSELVES by works of righteousness. 2. We can’t enter by digging under the wall, trying to get around God’s righteousness and salvation. Just as there would be only one way to enter a fortified city–through the only gate that was opened. So the only way to enter God’s SALVATION is through the gate He provided for us all–through Jesus Christ! 3. We Don’t Enter The City Because Of Righteous Works but by FAITH. “ You [the Lord] will guard him and keep him perfect and constant peace whose mind [both its inclination and its character] is stayed on You, because he commits himself to You, leans on You, and hopes confidently in You. So trust in the Lord (commit yourself to Him) forever; for the Lord God is an everlasting Rock [the Rock of Ages]” (Isaiah 26:3-4 AMP). Those are both well-known verses in the Bible. It shows that this righteous nation is righteous because they TRUST IN GOD; because such TRUST is unwavering trust; because their trust is in the Lord forever! When we TRUST IN GOD, it’s not because we carry around with us in our pockets coins that have a motto. We are declared righteous when we live in a strong city of FAITH; because Jesus bore our sins on a cross and so we may be given His righteousness. That is powerful! A Choice Between 2-Cities of Contrasts. TRUST in God allows us to inhabit the City of God, a city of salvation. TRUST in Man allows us to inhabit the “lofty” city, a city doomed to destruction. The City of Man looks secure–its “lofty”–great, dignified with beauty and magnificence. But like many beautiful cities in the world, looks can be deceptive. The city Isaiah is talking about will be demolished! TRUST in anything but God and trust is misplaced because this world that we are living in with all its values, its systems, will one day be destroyed. And when I mean ‘destroyed’, it may not necessarily be destroyed from earthquakes, volcanoes, floods, etc.. But destroyed from within by subversion. Look at the media today regarding the politics in the world. It’s happening as I write this blog. D. Which City Do You Spend Your Time In? Are you living in the City of Salvation or the City of Man? Are you trying to live in both cities; maintaining summer and winter homes in two different cities? Could you be known by your neighbors as Christian “snow birds”? You will need to make a choice. While we do business with the City of Man we are able to live in the City of Salvation.